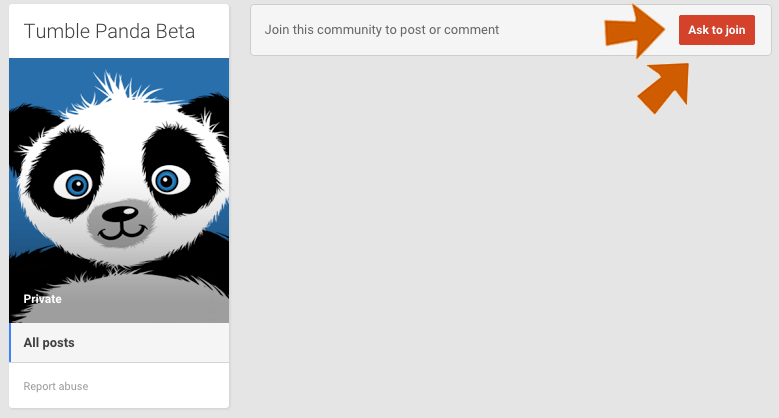 Recently, we launched the beta test of Tumble Panda. While this test is still ongoing, some of you may have already tried the game. All the others are still invited to join. Today I want to talk about the thoughts we had when building Tumble Panda’s monetization strategy. If you have played games like Candy Crush Saga, you have probably experienced something like this: You are beginning to enjoy playing a game, but then, all the sudden it tells you that you have No more lives and need to wait until you will get new ones. However, lucky you, there is a simple way to fulfill your desire to continue that darn level you had almost beaten: For the small amount of only $0.99, you will be granted another full set of sweet lives. Now this strategy surely is clever and the psychology that is at work in Candy Crash Saga can be the topic of at least one PhD thesis. Also, this way of monetizing would be very applicable for Tumble Panda: We could make the user wait after every 10th time he fails to complete a level. We could. However, we have a very clear idea how our games should be made: They should be free to play. And by that, we mean that it should be possible to always play the game and that it should be possible to win the game without having to pay for it. We do use in app purchases in our store, but it is never mandatory to use them. Also, we don’t like to use multiple currencies (such as gold and diamonds) when it is not necessary. That’s why we only use one currency in Tumble Panda, which the Panda’s most favorite: Bamboo. The user is our focus in Tumble Panda. We do never force them to buy anything or wait until they can play the next time or have them pay for an artificially shortaged currency. However, there are spots in our game where we think the user could want to make a purchase or get free bamboo by using Tapjoy. The first of this spots is when the user wants to purchase an item without having the needed amount of bamboo on their account. In this case we prompt the them to the bamboo-purchase part of the store. Here they have the possibility to purchase bamboo via in app purchases and get free bamboo by using an offerwall or by following us on social media. …that’s why you will be prompted to the bamboo store, in which more delicious bamboo can be obtained. The “Not enough Bamboo”-text you are seeing is a standard Android Toast using a custom TextView. Also, when making an in app purchase in Tumble Panda, we are giving a part of that to reforestation projects – more on that soon. 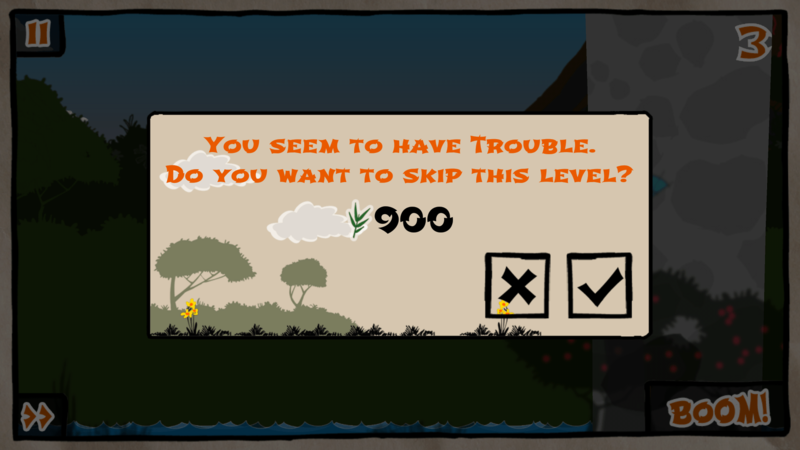 When a user repeatedly fails to finish a level, we ask them if they want to skip it. This comes to the price of 15 times the amount of bamboo that can be collected in the level. 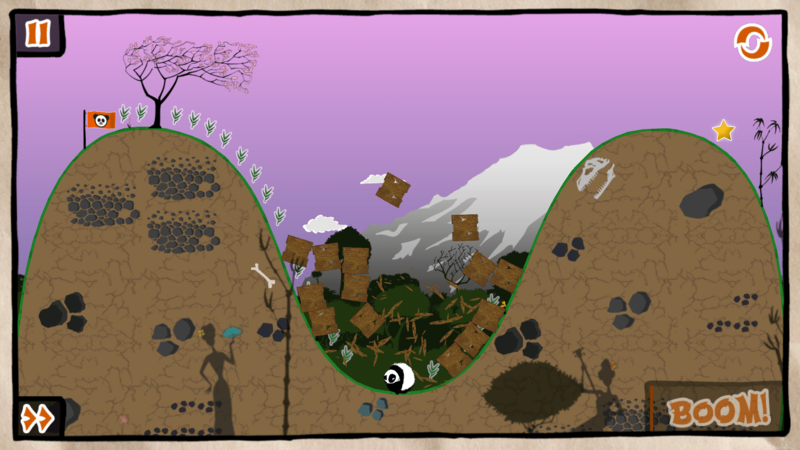 For example, in level 40 there are 60 bamboo to collect, which means skipping the level would cost 900 bamboo. Of course, when trying to skip a level without having a suitable amount of bamboo in one’s account, we will again prompt the bamboo store. Users will cancel purchases. May it be because they don’t remember their password to Google Play, an error occurred or they changed their mind. 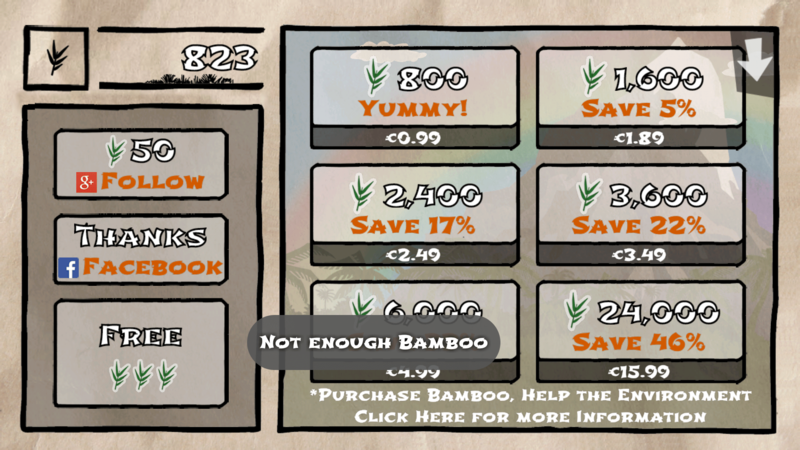 That’s why we are showing a dialog asking them whether they want free bamboo, once a purchase was canceled. 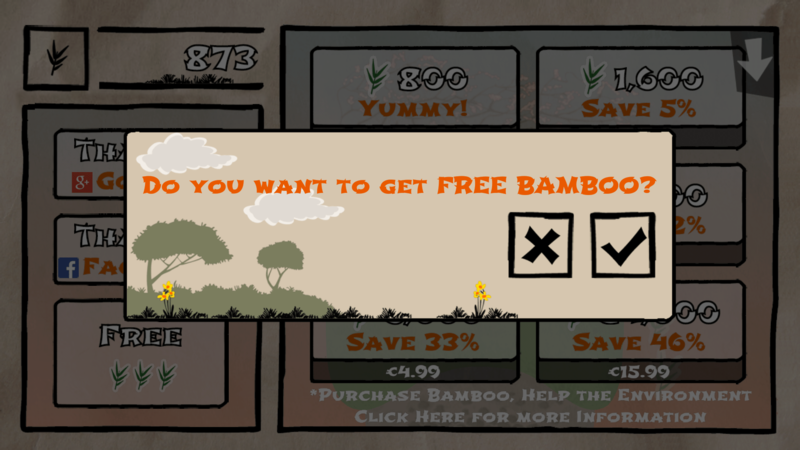 Accepting this offer leads to Tapjoy’s offerwall, where they can receive tons of tasty bamboo. Since we built a very non-aggressive strategy on monetizing via in app purchases and offer walls, we are using ads to further support us. When first designing Tumble Panda, we thought about displaying banner ads inside of the game, in a similar way Angry Birds used to. However, the times changed and full screen interstitial ads gained more and more acceptance while banner ads lost theirs. That’s why we also adjusted our strategy and are now exclusively relying on interstitial ads in Tumble Panda. We are trying to show a banner every 5th time a level is loaded and on average every 3rd time a user is accessing the main menu when coming from the game. In this way, we are providing a solution that is giving the user a less intrusive ad experience while still providing us with some earnings. For those of you that are interested in numbers, in the statistically not significant beta phase, this ad-backup-solution so far provided us with an ARPU (average revenue per user) of about $0.12 so far. Tumble Panda uses a monetization strategy that is much less intrusive than it could be because our main focus is a good user experience. We sincerely hope this will not harm the overall financial success of the game, but future will show. I will keep you updated! We will soon release our first big game, Tumble Panda. We put a lot of effort in this game, and I think we created a great and fun product. However, in order to find the last bugs and get your valuable feedback on where to improve next, we need beta testers. If you are interested, please go to our Google plus community and click on “Ask to join” . I will grant you access within 24 hours. Thank all of you that are joining in advance. I’m looking forward to your feedback. 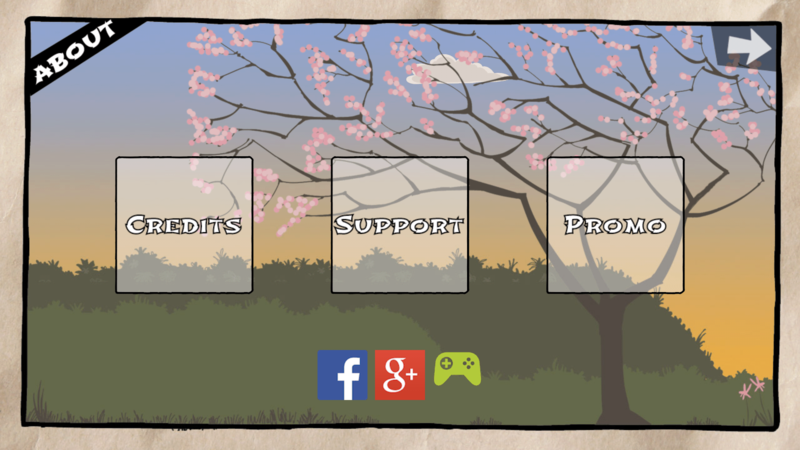 When creating a game, the About screen is probably the part of the game that is given the least effort. It does not give much benefit to the gamer and usually consists out of information such as credits, licenses and privacy information. However, it is still part of your game and should therefore be a nice part of your software with a pleasant user experience and a design fitting the rest of your product. 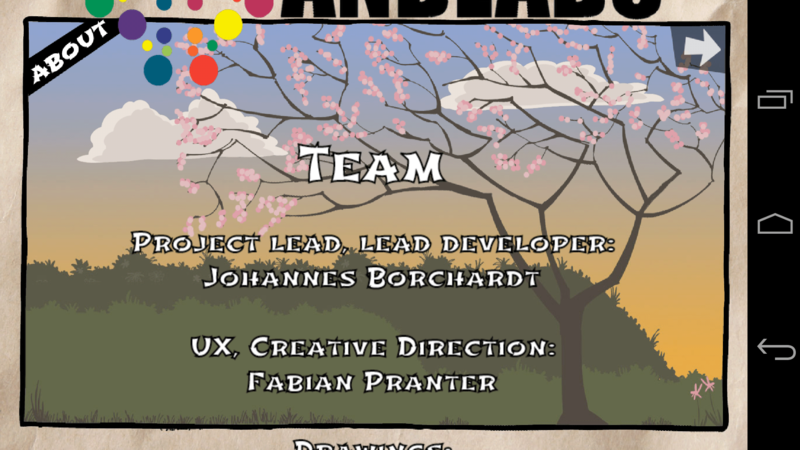 With our Game Tumble Panda, wie again went with an iterative approach and tried three different types of About screens, which I want to show you and discuss the good and the bad sides of. But before, let’s take a look at what you need to think about before building your own about screen. Depending on how much stuff you want to put in your about, you might want to chose its placement. Angry Birds for example uses a little info-button in the settings drop-up-menu in their starting screen, an approach that many seem to like. For us, we decided to make the about accessible via a button on the main menu, which is not hidden but smaller than all the other buttons (see this article to see the size of our “About”-menu-button). Once you know about your content and the navigation path to enter your about, it is time to select a design. For Tumble Panda, we tried three different types of designs, of which the first two are the most common ones. However, we found this didn’t quite fulfill what we wanted. It didn’t really suit the rest of the game and it would make using functionality like entering a promo code a hassle since one would have to wait for the right button to appear on the screen in first. And since promo codes are usually given to people you want to review your game, making this process as easy as possible is what one should be striving for. So we decided to try something different. Six buttons (phew, that’s a lot!)! 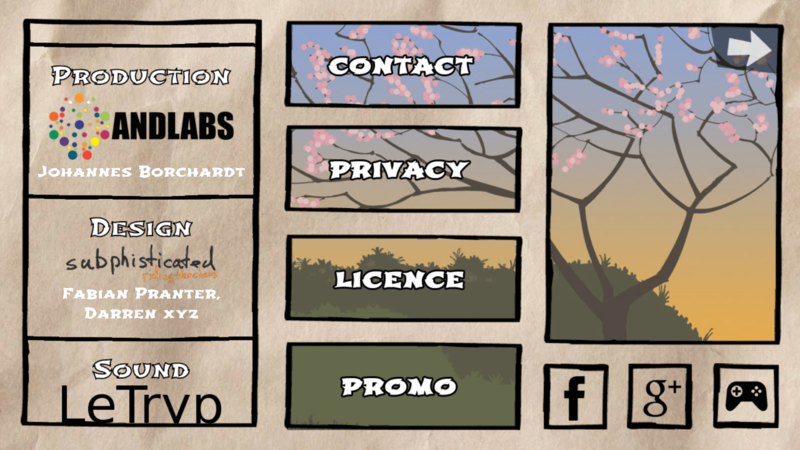 The “Credits”-button would lead to a dialog containing credits, licenses and so forth as a scrollable view. 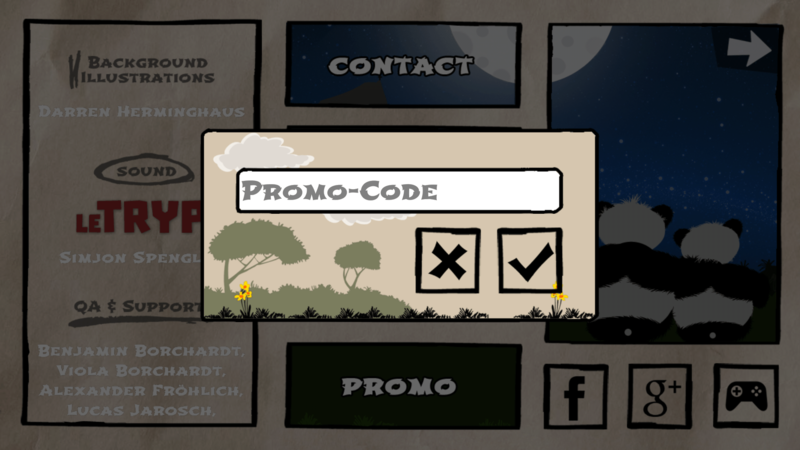 “Support” would bring you to a dialog which included buttons such as “Contact” and “Privacy”, and “Promo” was just responsible for showing a dialog for entering a promo code. Way too complicated! The screen was now divided in three parts. On the left are scrollable credits, in the center all important buttons. 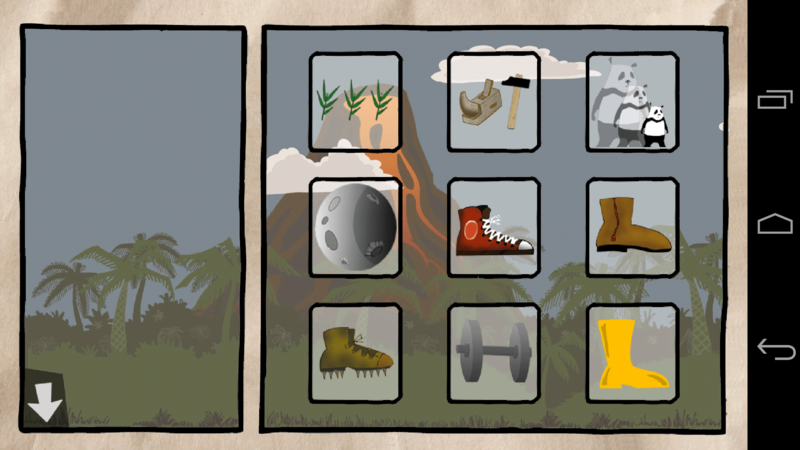 On the right are social media buttons and a mandatory google play games button, plus some empty space. “Contact” would fire an intent with some pre-defined text to our contact e-mail address. “Privacy” and “License” would open a web page and “Promo” would show a dialog. We decided to stick to this concept since we had the impression that this would easily let the user realize what every column is about. The center buttons make it clear they are clickable and the credits are recognizable as such, since they are scrolling all the time. The signs for Facebook, Google+ and google play games are easily recognizable since they are all well known brands. After we decided for the concept we wanted to take, we did one more iteration on the design side. The separators in the scrollable credits where replaced by margins and handdrawn highlighters for the different sections. We also changed the background scenery from the cherry blossom towards two Panda-kun and Panda-chan enjoying the full moon together. The take away from this article is: Every part of your game matters. Of course something as infrequently visited as the about should not need as much time as your main or level select menu. However, building an about screen in a totally loveless and/or unfitting way (e.g. using plain Android dialogs like Temple Run does when asking the users for rating) really disrupts the user’s experience of a game. Probably the scrollable credits or dialog version will suit your game. If not, it’s time to experiment. I would be really glad to hear your feedback and thoughts. Please feel invited to share them in the comments. When creating a game, the in-game store or shop is one of the most critical parts of it. It is the part that has the tendency to be the least fun for the user but is the most crucial for the developer. Without a shop, most in-app purchases won’t happen in your game. This is why, even though it may not be fun, a developer should pay close attention when building up his shop. 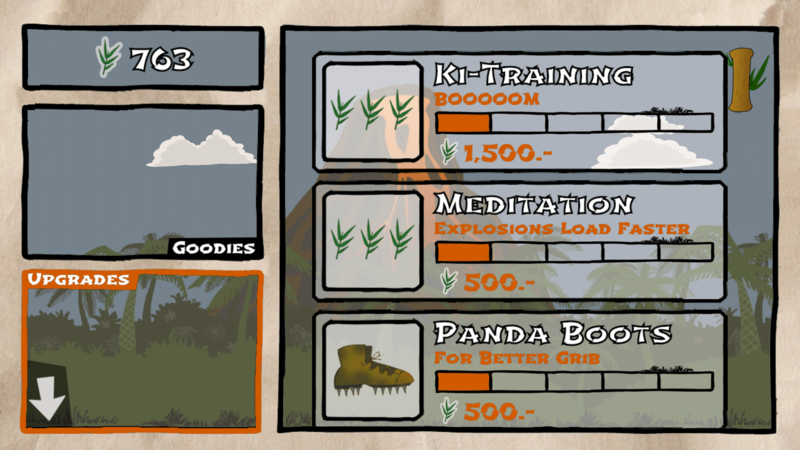 For our upcoming game, Tumble Panda, we put some effort and time into our shop and went through some iterations. With this game as an example, I want to show you how you can build a nice store. The design should fit the rest of the game. The design should be as minimalistic as possible while still highlighting the different functionalities of the virtual goods. Animations should be as quiet as possible. There should be little enough goods to not confuse the user while still providing enough variety to make purchases attractive. The flow from overview to purchase should be done with as little clicks as possible. There should be possibilities to gain in-game currency without having to pay “real” money. Furthermore, in order to keep it easy for us, and since we would need to experiment a bit to create a balanced variety of goods, we wanted to have the content easy to configure. From the number of screens, your store will probably look somewhat similar. A screen to purchase items and a screen for purchasing your in-game currency with “real” money are the vital parts of it. Then it is time to test and try out. First, we thought about a simplistic design that would show all the items we offer represented by icons. Once the user clicked on one of these items, he would be taken to the next step of the shopping procedure in which he would see the item’s details, like description and price, a bigger image of the item and confirm and cancel buttons. When testing this approach, we found that the initial display of small icons for all the items and details to them on click was simple, but only on the first view. Because for the user to find out about the different items, he would need to click on each, read through the description and then click on the next item. 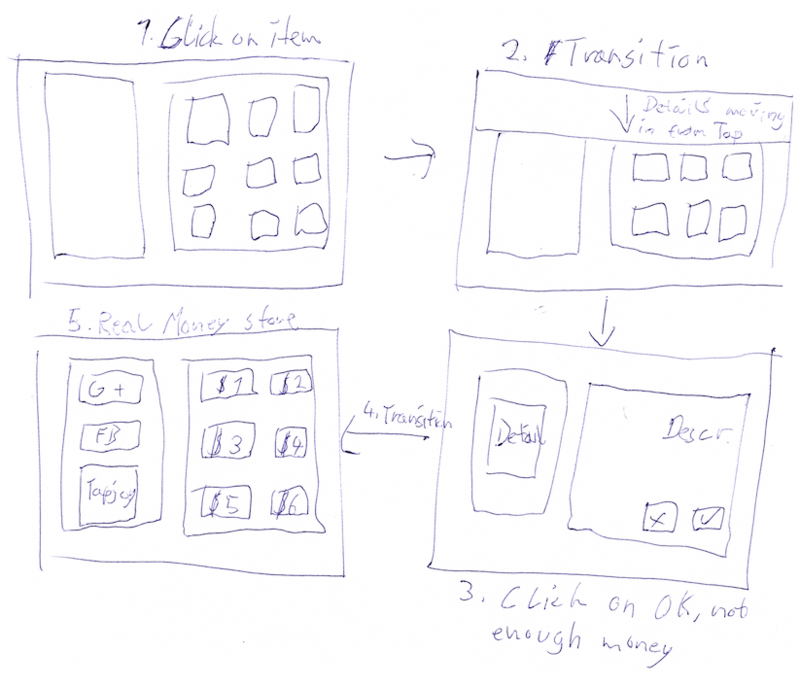 We had a trade-off between a simplistic design and a simplistic user interaction path. This changes are the reason why it is important for you to chose a method in which you can quickly test rough concepts and ideas, like just sketching them first, then implementing a basic version and putting the final finish only in the end. This way, major changes will be less pricy when they appear on this stage. Imagine you implement your complete store and then realize you sticked to the wrong concept and need to implement the whole UI interaction again. You need to as well talk to your users and have your different ideas tested. Then implement changes, based on your user’s feedback. In our case, the testing team consists of a mixture of employees, friends and relatives which span from the age of 7 to 52. This test-team should be not too big and fast in making responses so that you can really have a process of showing your work, receiving immediate feedback, improving upon this feedback, and showing your work again. Once you decided on the basic way your store’s design and interaction works, it’s time to go over the smaller parts. It should be a set of iterations with continuous improvements, followed by tests, followed by the next iteration. Here is an overview over the various iterations we took on our store. 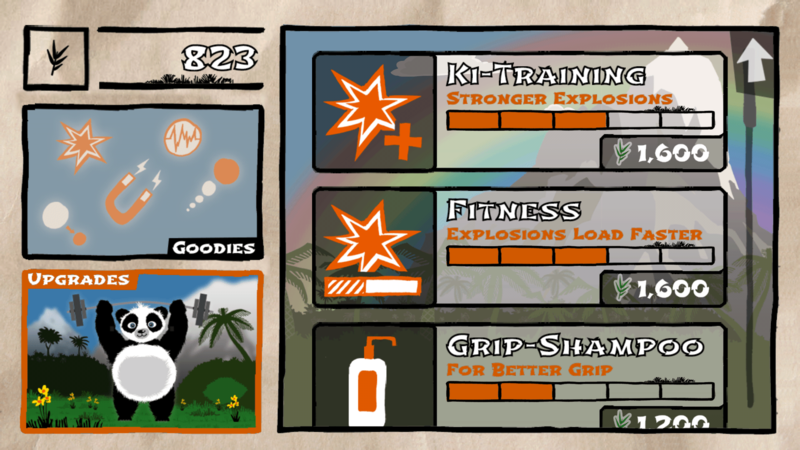 As you can see, we sometimes only did small graphical changes, trying to improve more and more. Then, in the end, we gave it the final touch and it is now in the state in which it will go into the beta testing phase. When you look closely to the changes we made, you may notice that not only the graphics changed, but also the content of the store. In the process of development we found out, that some of the items we thought would be good to have in our store weren’t but others were. The items in a store should be useful and affordable enough to make some of them easy to purchase, but not cheap enough to buy through the game without making real money purchases. The prices of your store and your virtual currency determine the value you give to the user’s time. If you for example give up to 50 gold coins for a level for which the user needs 2 minutes to play and offer 1000 gold for $0.99, that would give the users time a value of $0.02475 per minute. Obviously this value shouldn’t be too high nor insultingly low. Furthermore, the items in your store should provide some use to the user. In our case, we created two categories for Tumble Panda, items that are consumable and which can be used once and need to be re-purchased, and items that improve the protagonist’s power gradually and stay forever. To balance your content well, I recommend to do some more iterations with your Alpha-testers, track their behavior, for example with Flurry (we use this one) or Google Analytics, and ask them for more feedback. In the end I hope we met all the criteria we specified. Some things may still need adjustment, but the beta phase will show. Besides a clear set of criteria to measure against, consecutive iterations with a set of testers involved are crucial to creating the store that not only you but also your users love. Personally, I also like to break the content down to the essential elements with every screen being responsible for exactly one thing, while keeping buttons and touch areas big, since the store is designed for a mobile device. The store of Temple Run for example really appeals to me, since it has all the stuff in one place, while items are still clearly grouped using separators and the user does not need many clicks to purchase an item. I’m interested in unconventional and great ways of implementing stores and monetization systems. If you know any, please feel invited to share in the comments. P.S. 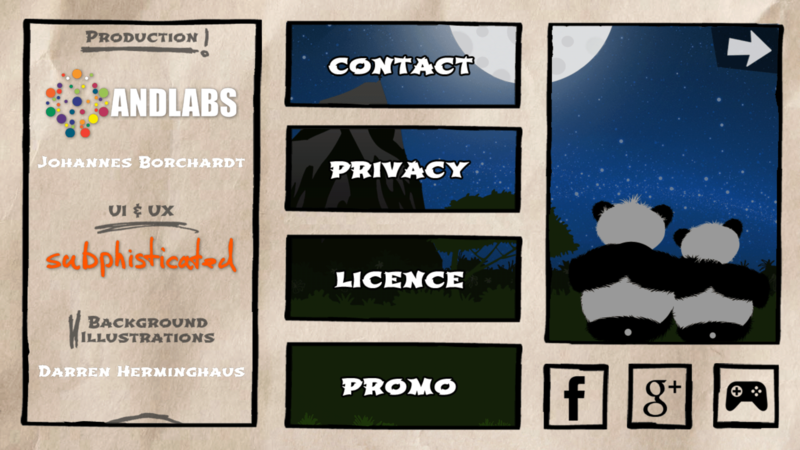 : We are looking for beta testers for Tumble panda. If you want to join, please let me know.